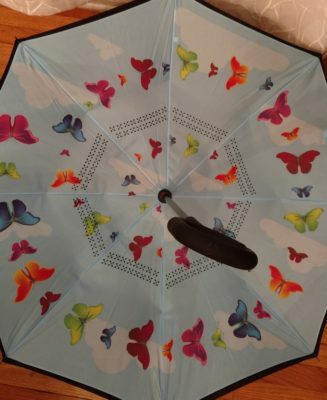 Cheery inverted umbrella is a must-have when skies are gray! - Susan Said... WHAT?! My mother loves to remind me that when I was in middle school, some of the many, silly things that I refused to do included wear a hat in the winter, use snow boots, and carry an umbrella in the rain. Apparently, these things were not “cool” so I (and all of my middle school friends) would arrive at our destinations with windblown hair, freezing cold, or soaking wet! Today I am a little smarter. Hats and boots are an absolute must here in the Northeast. And, I have a whole selection of umbrellas – everything from tiny umbrellas that fold up and fit into my smallest bag, to full-sized, colorful golf umbrellas so large that they could shelter my whole family. My latest addition is easily the most technologically advanced… and the cutest. It’s the Brightman Inverted Butterfly Umbrella. I was unfamiliar with the term inverted umbrella until I received this one. If you are unsure, as well, I will try to explain. The surface of the inverted umbrella is waterproof and folds away from you (inside out) so you won’t get wet getting in or out of the car or house. It’s amazing! The design also allows it to stand on up on its own, keeping the wet part of the umbrella inside once you’ve closed it. No more mess shaking out a wet umbrella while coming indoors! This inverted umbrella is also very strong, with a double layer of ribs to make it even more sturdy. It’s basically windproof. 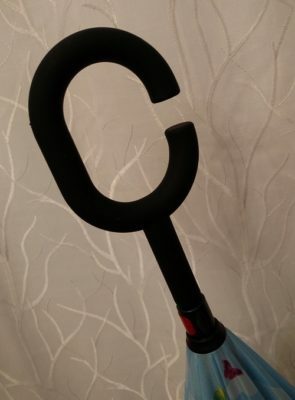 It even has a C-shaped handle, which is incredibly comfortable and makes juggling keys, a phone, a bag and an umbrella infinitely easier when the heavens open up. Of course, I wouldn’t share it with you unless it was also adorable! The top of the umbrella is classic black (very proper and businesslike). But, the whimsical butterfly pattern is on the underside, like a surprise just for the carrier. 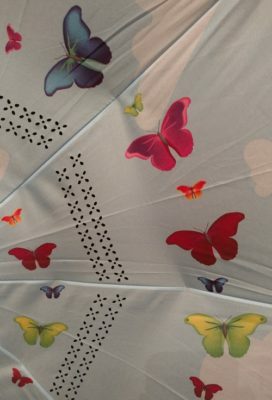 It may be raining outside, but underneath you’re protected and surrounded by blue skies and a cloud of colorful butterflies! This is a petite umbrella, perfect for one (or for a child). It measures 19” in diameter, whereas a standard umbrella is approximately 23”. It provides better much coverage than a similarly sized, travel sized umbrella, however, due to the curvature. A travel sized umbrella tends to be very flat when unfurled, due to the way it is designed to fold back up. This inverted umbrella has a standard curvature for maximum protection. Retail $24.99 on Amazon. While you’re here, please take some time to enter our latest giveaway for a charming travel wristlet. Giveaway ends 4-1-2019. To see giveaways around the Internet, or add your own giveaway FREE, visit our LINKY. DISCLAIMER: No financial compensation was received in exchange for this post. I did, however, receive a product sample of the umbrella in order to fully test and product and provide an honest review. Regardless, I only recommend products or services that I believe will be good for my readers. I found the ultimate summer-to-fall transition dress!